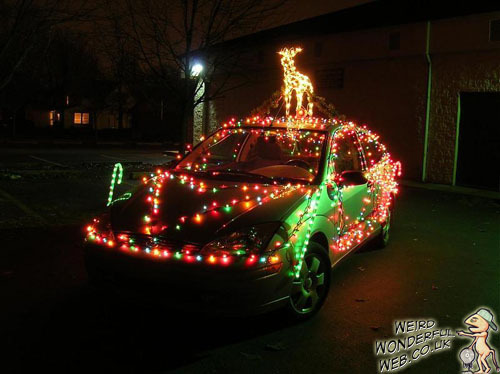 Weird Wonderful Web: Xmas decorated car complete with reindeer! A family car covered in Christmas lights. The family saloon, lit up like a Christmas tree. I like the way this one has an upright reindeer strapped to the roof, but an evil something in me wishes the car was a redneck truck, and the Christmas light reindeer was strapped down on a rack like it had been hunted. That would be a cool picture. Driving along - "what's that funny noise on the roof" says the wife. "Oh I think it's just the rain dear" says the husband absolutely heart-stopping hilariously.